Details relating to the Belgian Commemorative of 2008. 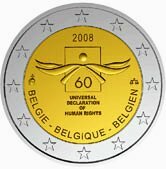 Belgium is the first country in the Euro Zone to issue a coin to commemorate the Universal Declaration of Human Rights. A rough precis of the meaning is: ”All people are born free and equal in dignity and rights, regardless of Race, Colour, Gender, Language, Religion, Conviction, Origin or Possessions”. For the full and complete declaration, click on the above link. On the occasion of the 60th anniversary the UN started a campaign, the Logo of which, Belgium has used as the motif for the coin. The motif is a rectangle with what appears to be a ribbon wrapped around it.At the bottom of the rectangle is the number 60 and above the 60 a small black circle. Above the rectangle is 2008 and below the inscription “UNIVERSAL DECLARATION OF HUMAN RIGHTS”. Around the edge of the bottom of the inner circle is the name of the issuing country in Flemish, French and German – BELGIE – BELGIQUE – BELGIEN”. The mint mark is at nine o’clock and the mark of mint director at three o’clock. Return from Belgian Commemorative 2008 to euro coin collector.